A foundational pillar of Obama’s re-election campaign was promoting the myth that he was a great statesman, having killed Osama bin Laden and having made the nation and world safe from Islamic terror groups like al-Qa’ida. The Patriot Post is protected speech pursuant to the “unalienable rights” of all men, and the First (and Second) Amendment to the Constitution of the United States of America. In God we trust. 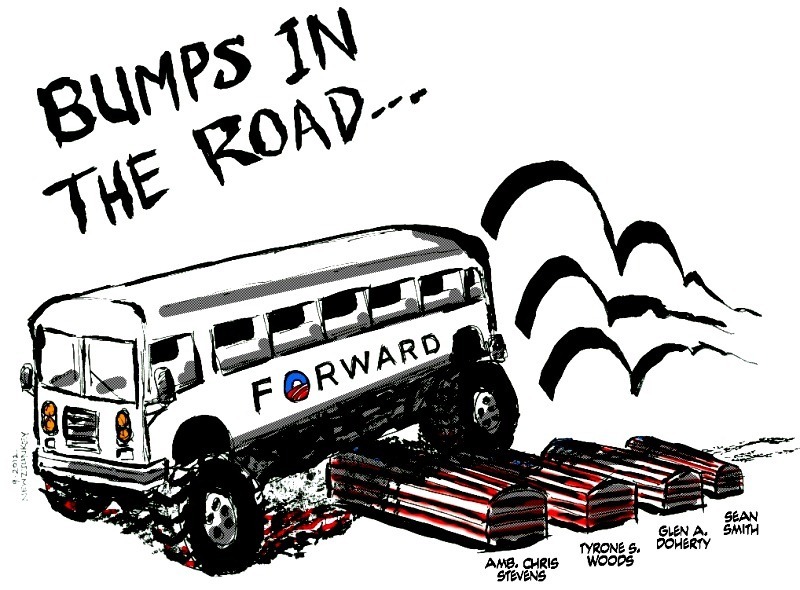 Copyright © 2014 The Patriot Post. All Rights Reserved. Here is the full Lara Logan interview with Morgan Jones (pseudonym) who was at Benghazi when Islamic Terrorists attacked the U.S. compound in which Ambassador Chris Stevens, Sean Smith, Glen Doherty, and Tyrone Woods were all brutally murdered. Lara Logan reports on the events in Benghazi, Libya, September 11, 2012. The al Qaeda attack killed four Americans, including Ambassador, Chris Stevens. Justin Smith properly castigates President Barack Hussein Obama and his Administration over Benghazigate. The above quote is there to wet the thirst of your curiosity. While I understand the current mission of the U.S. African Command to counter, stop and destroy Islamist militants and to fight terrorism without being drawn into a major conflict, the lack of preparation and the ignored warnings prior to the 9/11 attacks on the U.S. facilities at Benghazi are inexcusable and indefensible; repeatedly we have heard Obama and everyone associated with his administration declare that the U.S. response to these attacks was “adequate.” But more than this, as more facts are uncovered, no doubt is left that this administration is incompetent, and it is engaged in a cover-up of mammoth proportions. 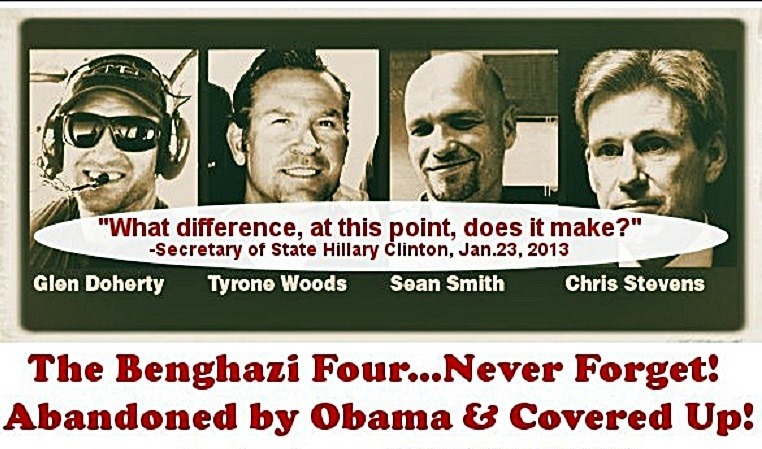 I also wonder if Obama himself or Hillary Clinton has explained to the families of Christopher Stevens, Sean Smith, Tyrone Woods and Glenn Dogherty just how “adequate” the response really was? I’ll bet Tyrone Woods thought the response was “adequate” as he painted the terrorists’ mortar armed position with a laser and waited for it to be bombed by a drone or jet fighter from Aviano Airbase (Italy)… right up until he cursed Obama with his last dying gasp. In conjunction with Glenn Dogherty’s Libyan mission to recover advanced weapons systems, such as SA-7 missiles from the hands of the Islamists, Ambassador Stevens was negotiating a weapons transfer and removal of SA-7s from the hands of Libyan extremists on the night of 9/11; FoxNews recently reported that the Libyan vessel ‘Al Entisar’ arrived in the Turkish port of Iskenderun, just 35 miles from the Syrian border, on September 6 with a cargo of RPGs, shoulder launched missiles and surface-to-air anti-aircraft missiles. Add to this Stevens’ meeting with Turkish Consul General Ali Sait Akin the night Stevens was murdered, and it is not far-fetched, rather highly likely, that the Obama administration has been running weapons through Turkey to the rebels in Syria, mostly comprised of Islamists and Al Qaeda and enemies of the U.S. 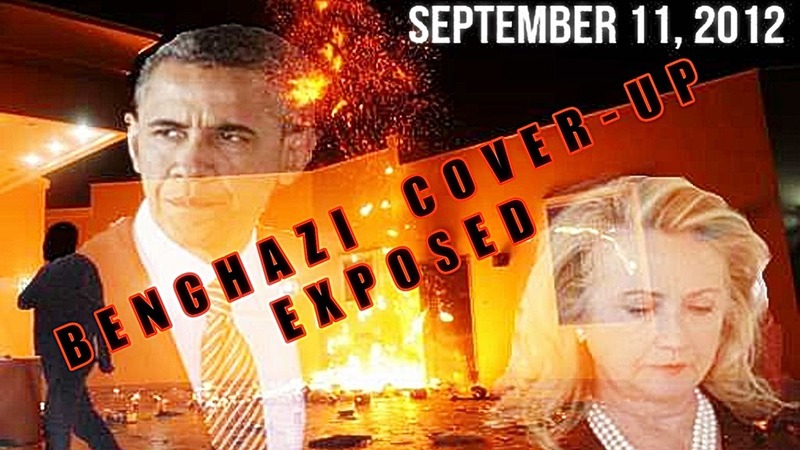 Although Clinton stated before the Senate Foreign Relations Committee, “I am determined to leave the State Dept and our country safer, stronger and more secure,” her determination on 9/11/12 was focused on joining in the spinning of the story, the obfuscation and outright lies originating with Obama. Clinton was actually notified of the attacks around 4PM and about an hour before Obama was notified by Leon Panetta. Apparently they sat on their thumbs and spun afterwards, despite Clinton’s claim that “we kept talking with everyone through the night.” But through a response garnered by Senator Lindsey Graham’s efforts in blocking Chuck Hagel’s nomination for Secretary of Defense, we know neither Clinton nor Obama attempted to contact government officials in Libya to help rescue our U.S. citizens that night, if time and logistics really were the problem; however, Obama did call Clinton at 10PM, and it was “about 10PM” when the State Dept released Clinton’s statement (FactCheck.org) entitled ‘Statement on the Attack in Benghazi’, which linked the attacks to an anti-Islamic video. After Senator Ron Johnson (R-Wisc) placed Hillary Clinton on the spot regarding the fact that no protest existed prior to the attack, Clinton angrily retorted, “What difference… does it make?” The difference it makes is this, Mrs Clinton: Your outright lying and collaboration with Obama in this matter created a delay that cost Tyrone Woods and Glenn Dogherty their lives; no good reason can be given for not having ordered an airstrike on the terrorists’ position. And for fear of forced retirement and other curious reasons, some of the upper echelon military ranks have lost their spine, as they support the Democratic Party line, Obama’s position and the delusive findings of the ARB! As I recall Obama and Clinton meeting flag-draped coffins of four brave Americans in feigned respect, I am ashamed of a people who could reelect such a thing to the Office of the President. A president should always strive for more than “adequate,” because to be merely adequate is meeting only a bare minimum of requirements; while Jay Carney quotes page 37 of the ARB report, “the safe evacuation of all U.S. government personnel from Benghazi twelve hours after the initial attack… was the result of exceptional… military response…,” an immense number of accomplished military minds such as Lt. Col. Tony Schaffer and Gen. William Boykin, ex-Commander of U.S. Special Forces, have refuted this analysis, which leaves dozens of unanswered questions: Why haven’t Americans heard from the surviving diplomatic security officer, who saw the attack begin and alerted the U.S. Embassy in Tripoli that they were under siege? … Why haven’t we heard the testimony of the thirty-two survivors, who Gen. C.K. Hyde confirms were evacuated to Ramstein Airbase (Germany)? … Why didn’t the Turkish Consul General warn Ambassador Stevens about the Al Qaeda checkpoints after he left at 8:35 PM Benghazi time? It doesn’t matter that protocol and standard operating procedures were followed and the response was “adequate.” Whatever happened to initiative and rising above and beyond the call of duty? No doubt remains that Tyrone Woods and Glenn Dogherty’s deaths were unnecessary, preventable and lay on Obama’s head! Explanatory links are provided by the editor.